We love the small ship feel and especially Azamara as everyone fells equal. The new ship looks great with a modern feel to the cabins but a few problems with moisture were seen as they had to run dehumidifiers in certain areas. We were in a Club Continental suite which was very comfortable, lots of storage, nice bath/shower and cleaned constantly. As I am asthmatic they had already removed feathers and any sense enhancers. The only problem is the makeup mirror in the bathroom must have been installed by a man as it is placed for a 6 foot person. Again great staff come to the rescue for a 5foot lady. A female officer lent me her personal makeup mirror for the entire cruise. The new chairs in Aquilinia were very comfortable even though others had said other wise. The new lounge chairs on the Sanctum are very uncomfortable as they do not recline, but again the great AZ staff upon request brought the regular reclining lounge cots out for my husband. We missed the double lounge cabana that was outside in this area as it blocked sun as well as being cosy for a couple. Food was very good to excellent, Aqualinia still shines with their Dover sole and in Prime C the fillet minion is outstanding and I am not a big meat eater. Lots of excellent appetizers, deserts were better than the previous cruises. Windows cafe and The Patio were also very good with excellent variety. Entertainment is where there is a let down. The musical trio in the living room were so so, sometimes better than others. The shows were generally poor but their in house singers/dancers did do some good shows. The comedian was not bad but the rest were not worth watching. We did not attend the lectures or other activities. 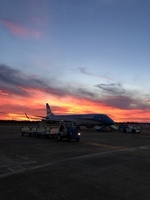 Service is where AZ shines, we boarded in Buenos Aries and did have to wait for a short time but it was done in an organized fashion and once on the rooms were already to drop your carry on. To our surprise as we walked towards our room we recognized our butler from our last year cruise as he had been moved to this new ship. Again in AZ fashion he greeted us with our names and remembered us with a greeting of my Canadians. Elro was always able to fulfill our requests with a smile. We left from Buenos Aries stoping in Montevideo where AZ put on the most fabulous Azamazing evening in the Solis theatre, it was unique entertaining and interactive. Well done AZ. Santos Brazil was interesting with some great views and the coffee museum. Buzios Brazil was a lovely beach town friendly people great boutiques, fabulous gelato and nice cafes. Nice day on a great beach with fresh fish lunch. Paraty was a quiet beach town with little infrastructure and a dock in poor shape. We did a private boat day which was nice. Rio stop was ok as this is such a dangerous city we used a guide. It was hot and line ups were long even early in the morning. The rain forest in the city is beautiful and the beaches crowded but lovely looking. As it was New Year’s Eve soon roads were blocked off near Copacabana Beach by noon. Our Captain (Carl) changed the next port because of bad weather and stopped in a beach town which was a good decision as weather throughout the cruise was excellent. We then stopped for one day instead of two in Punta del Este a very high class city taking an AZ tour to the seal island and then walking to the sculpture of the hand in the sand. Lovely cafes, restaurants, and shops. The New Years was outstanding, AZ did their white night on deck and amped it up for New Years. Food was great entertainment fun, hats blowers and beads were given out as well as sparkling wine for midnight toast. The fireworks viewed off the Copacabana Beach were spectacular. It made for a memorable night. 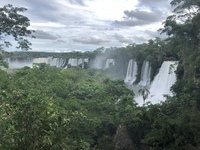 We took a special day tour the last day in BA arranged by AZ to Iguazu Falls. It was costly but done well from start to finish. A long day but worth it, they even arranged a dinner at a hotel so we would not need to eat so late upon return. Internet was ok but a pain to keep putting a code in each time to use on my IPad. We love the small ship feel and especially Azamara as everyone fells equal. The new ship looks great with a modern feel to the cabins but a few problems with moisture were seen as they had to run dehumidifiers in certain areas. We were in a Club Continental suite which was very comfortable, lots of storage, nice bath/shower and cleaned constantly. As I am asthmatic they had already removed feathers and any sense enhancers. The only problem is the makeup mirror in the bathroom must have been installed by a man as it is placed for a 6 foot person. Again great staff come to the rescue for a 5foot lady. A female officer lent me her personal makeup mirror for the entire cruise. The new chairs in Aquilinia were very comfortable even though others had said other wise. The new lounge chairs on the Sanctum are very uncomfortable as they do not recline, but again the great AZ staff upon request brought the regular reclining lounge cots out for my husband. We missed the double lounge cabana that was outside in this area as it blocked sun as well as being cosy for a couple. Food was very good to excellent, Aqualinia still shines with their Dover sole and in Prime C the fillet minion is outstanding and I am not a big meat eater. Lots of excellent appetizers, deserts were better than the previous cruises. Windows cafe and The Patio were also very good with excellent variety. Entertainment is where there is a let down. The musical trio in the living room were so so, sometimes better than others. The shows were generally poor but their in house singers/dancers did do some good shows. The comedian was not bad but the rest were not worth watching. We did not attend the lectures or other activities. Service is where AZ shines, we boarded in Buenos Aries and did have to wait for a short time but it was done in an organized fashion and once on the rooms were already to drop your carry on. To our surprise as we walked towards our room we recognized our butler from our last year cruise as he had been moved to this new ship. Again in AZ fashion he greeted us with our names and remembered us with a greeting of my Canadians. Elro was always able to fulfill our requests with a smile. We left from Buenos Aries stoping in Montevideo where AZ put on the most fabulous Azamazing evening in the Solis theatre, it was unique entertaining and interactive. Santos Brazil was interesting with some great views and the coffee museum. Buzios Brazil was a lovely beach town friendly people great boutiques, fabulous gelato and nice cafes. Nice day on a great beach with fresh fish lunch. Paraty was a quiet beach town with little infrastructure and a dock in poor shape. We did a private boat day which was nice. Rio stop was ok as this is such a dangerous city we used a guide. It was hot and line ups were long even early in the morning. The rain forest in the city is beautiful and the beaches crowded but lovely looking. As it was New Year’s Eve soon roads were blocked off near Copacabana Beach by noon. Our Captain (Carl) changed the next port because of bad weather and stopped in a beach town which was a good decision as weather throughout the cruise was excellent. 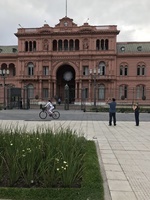 We then stopped for one day instead of two in Punta del Este a very high class city taking an AZ tour to the seal island and then walking to the sculpture of the hand in the sand. Lovely cafes, restaurants, and shops. The New Years was outstanding, AZ did their white night on deck and amped it up for New Years. Food was great entertainment fun, hats blowers and beads were given out as well as sparkling wine for midnight toast. The fireworks viewed off the Copacabana Beach were spectacular. It made for a memorable night. We took a special day tour the last day in BA arranged by AZ to Iguazu Falls. It was costly but done well from start to finish. A long day but worth it, they even arranged a dinner at a hotel so we would not need to eat so late upon return. Internet was ok but a pain to keep putting a code in each time to use on my IPad. Large and modern clean some noise from above when moving chairs. Mirror for make up is built for a six foot tall person, totally unusable. Lots of storage nice table on balcony and a swivel chair. TV did not display your account as they said it was not set up yet. Heat and long day worth it to see such natural beauty. Nice weather toured with AZ to Isla de Lobos then walked with others to the sculpture and had a snack at a cafe. Nice shopping. Saw the beaches and the rainforest. Got to all areas of the city.